Bomb In Upscale Mall Kills 3, Injures 9 In Colombia : The Two-Way Colombia's president called it a "vile, cruel and cowardly act." A militant group known for previous attacks denied involvement. 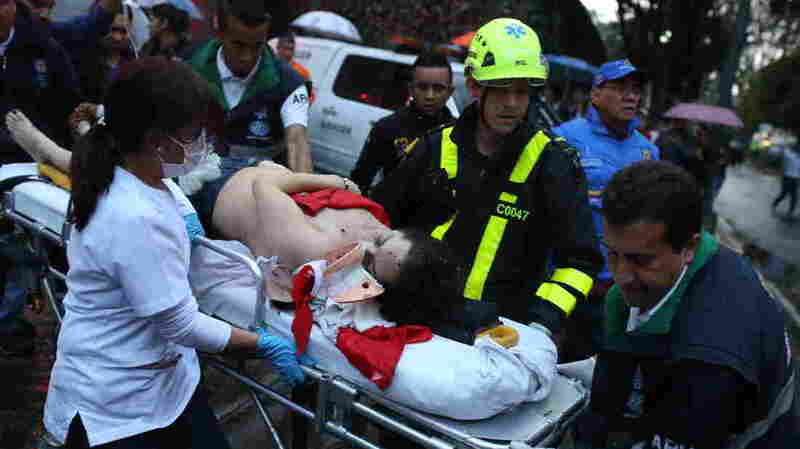 A woman is taken away on a gurney after an explosion at the Andino shopping center in Bogota, Colombia, on Saturday. A bomb that exploded in a crowded shopping mall killed three people and injured nine more in Bogota, Colombia Saturday. The bomb exploded in the second-floor women's bathroom of the Andino shopping mall, which contains a number of upscale stores. Colombian authorities called it an act of terrorism; no one has yet claimed responsibility for the bombing. The mall was evacuated after the explosion, which occurred at about 5 p.m. local time. "We won't let terrorism frighten us," Colombian President Juan Manuel Santos said, according to Reuters. He spoke from inside the shopping center. He tweeted that Colombians should "continue life as normal" in the face of attacks. "This vile, cruel and cowardly act will not go unpunished," he wrote. Among the dead was a 23-year-old French woman who was in the country volunteering, John Otis reports for NPR's Newscast. Bogota Mayor Enrique Peñalosa called it a "cowardly terrorist act." President Santos was a strong advocate for last year's peace deal signed with the FARC guerrillas to end a more than 50-year civil war. The group is in the process of disarming and handing over weapons to the United Nations, though bomb past bomb attacks have been attributed to the FARC. Another militant group, the National Liberation Army, known commonly as the ELN, has carried out bombings in the past, including an attack in February that killed a police officer and injured 20 others. But according to The Associated Press, the group sent a tweet denying involvement and claimed to not target civilians. The ELN is the country's second-largest militant group and is currently negotiating its own peace deal with the Colombian government. Reporter John Otis contributed to this report.